Shrewsbury - Fourth-graders from Coolidge Elementary School (l to r) Shaloni Patal, Olivia Meuse, Rebecca Shan, Alex Cashman, Grace Zucchero and Joe Morgan learn about electrical transformers from Scott Stark during a May 13 field trip to Shrewsbury Electric and Cable Operations (SELCO). Over 500 students, including fourth-graders from all public schools and third-graders from St. Mary School, toured the facility, viewed a video and participated in activities with an emphasis on electrical safety. SELCO is a community-owned and -operated utility offering services to Shrewsbury residents and businesses at competitive prices. Photo/Ed Karvoski Jr.
Shrewsbury – Fourth-graders from Coolidge Elementary School (l to r) Shaloni Patal, Olivia Meuse, Rebecca Shan, Alex Cashman, Grace Zucchero and Joe Morgan learn about electrical transformers from Scott Stark during a May 13 field trip to Shrewsbury Electric and Cable Operations (SELCO). 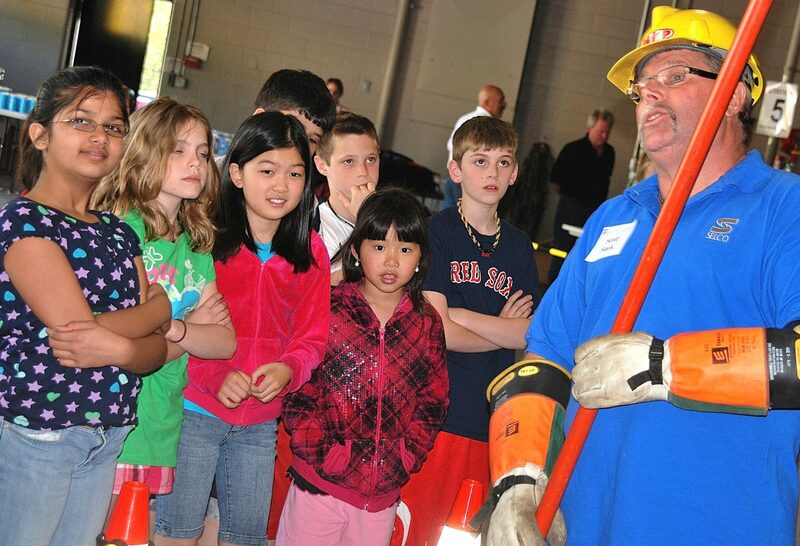 Over 500 students, including fourth-graders from all public schools and third-graders from St. Mary School, toured the facility, viewed a video and participated in activities with an emphasis on electrical safety. SELCO is a community-owned and -operated utility offering services to Shrewsbury residents and businesses at competitive prices. Photo/Ed Karvoski Jr.